Each year on the Tuesday after Thanksgiving, nonprofits across the globe participate in #Giving Tuesday. #Giving Tuesday is the online event that began in 2012 and has resulted in donations for thousands of nonprofits large and small. Participating organizations have witnessed steady increases year after year — this year, we hope that you will make SkyTruth the nonprofit you choose to support because without you, we would not be able achieve our mission to share the view from space to inspire people to protect the environment. Our work is possible because of you. This year, we are excited to announce that one of our generous donors has agreed to match all #GivingTuesday donations up to $1000! This means that your gift will go twice as far! Please make your gift today, November 27th, before midnight in order to double your impact. Finally, be sure to watch our social media channels (Facebook, Twitter, and Instagram) throughout the day to track our progress in meeting this matching challenge. Donate here and thank you in advance for your support for SkyTruth. Seeing is believing. And if you can see it, you can change it. 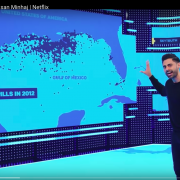 Last week, SkyTruth made an appearance on Netflix when their show Patriot Act with Hasan Minhaj used our interactive map of oil spills reported in the Gulf of Mexico in the years following the BP / Deepwater Horizon disaster. 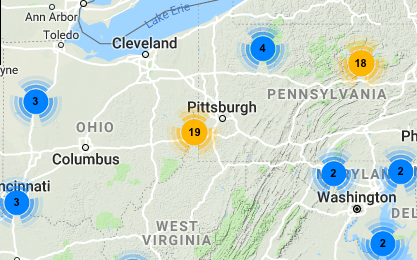 To learn more about the ongoing 14-year Taylor Energy leak that was the focus of this episode, check out our chronology of spill reports and observations at the site, as well as our most recent estimate of the cumulative oil spill based on those reports. This appearance follows a recent front page article in the Washington Post on the “oil spill you have never heard of” that also referenced reports and data generated by SkyTruth. These are two great examples of how the work we do helps raise awareness of incidents of oil pollution and other types of environmental degradation across the globe. https://skytruth.org/wp-content/uploads/2018/11/patriot_act_w_hasan_minhaj.png 853 1440 Johnna Armstrong /wp-content/uploads/2016/08/test_logo.png Johnna Armstrong2018-11-20 11:37:252019-02-01 11:44:26SkyTruth appears on Netflix! 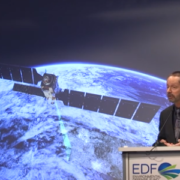 Our own John Amos recently made a presentation at Environmental Defense Fund’s Science Day symposium called Satellite Remote Sensing for Environmental Protection. It’s available below and on our YouTube channel. For the last year or so we’ve been working to revamp SkyTruth Alerts, an app we built for ourselves in 2011, and then opened up to the public a year later. 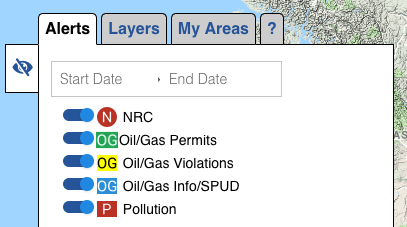 The Alerts lets you see environmental incidents and notifications on a map as they are reported, and allows subscribers to sign up to receive email notifications about reported environmental incidents in areas they care about (aka “Areas of Interest” or AOIs). Technology has made a few leaps since then, so it was time for an overhaul. We’ve added some new features too. We’re excited about the changes, and we hope you will be too. 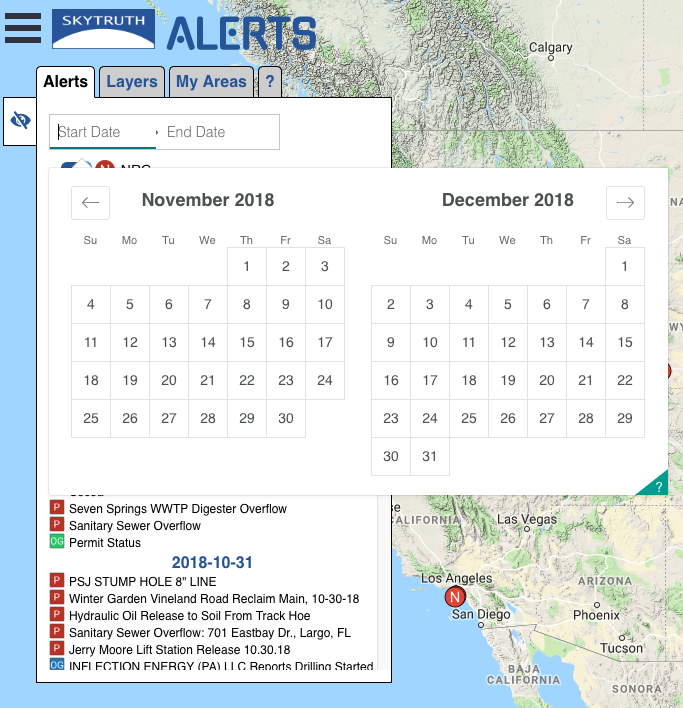 In a lot of ways, the new SkyTruth Alerts app works the way it always has: anyone can view the map and see the latest reported alerts for a particular area. These notifications come from federal and state websites that we have “scraped” to obtain the reports. 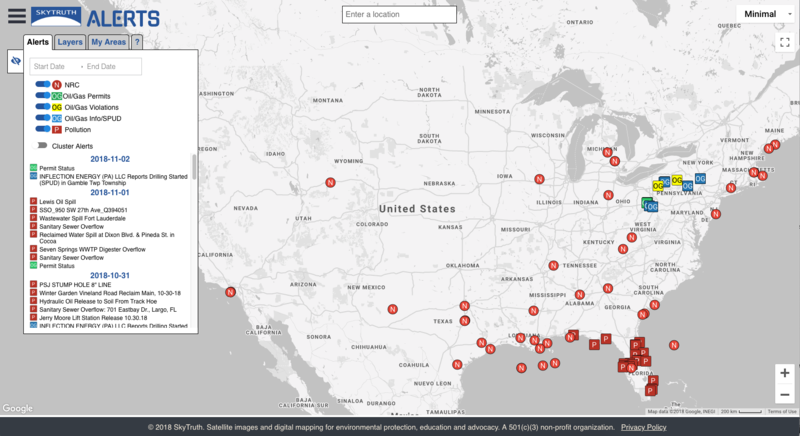 The largest source of data is the nationwide oil and hazardous materials spill reports collected by the National Response Center (i.e., NRC Reports). Anyone can sign up to receive email notifications about incidents in their AOIs. We’ve also added account management so you can update your AOIs or change your email address more easily. Signing up for an account will also let you take advantage of new tools we’ll be rolling out in the coming months (we’ll keep you posted after the launch). After you create an AOI, you can edit your AOI (or delete it and start again) before giving it a name and saving it to your My Areas list. Select from a couple of different map backdrops (“base layers”) so you can focus on what’s important to you. 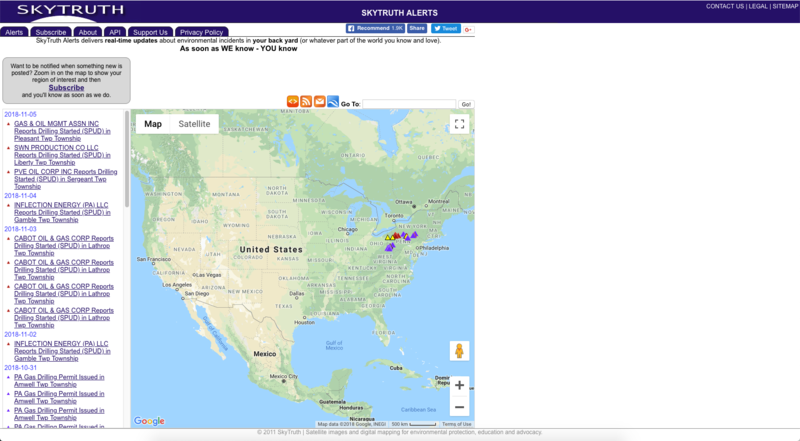 Below is a screenshot of SkyTruth Alerts using the “Minimal” base layer. 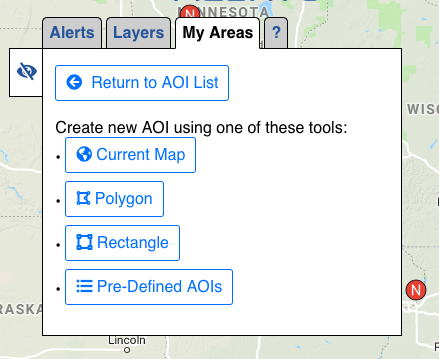 This can be useful if there are a lot of alerts in the surrounding area that are more recent than the alerts within your AOI. In some places, there are many, many alerts in the same location. This can make it hard to move around the map because you end up clicking or tapping an alert marker when you wanted move around in the map view. It can also be hard to “grab” a particular alert marker from a stack of them. In the first screenshot, clustering is turned on, making it easier to move around the map. Click on a cluster marker to zoom in on that area and see more alerts. Once you’ve zeroed in on your area of interest, it can still be hard to see the forest for the trees in some locations. In the next image, clustering is turned off. You can see that there are a lot of alerts in this area, but how many exactly? The image below shows the same area as the one above. If you click on one of the alert markers, it will “explode,” showing you all of the alerts in that location. Click on any of the exploded markers to view the report. We’re getting ready to begin alpha testing in in mid-November. Lots of our current subscribers have volunteered to be testers and will be helping us put the finishing touches on the app. A big thank you to all of you who are helping us with that! Testing will last four weeks, and during that time we’ll be making continuous updates based on feedback we receive. We expect to go live with the new version by the end of the year. 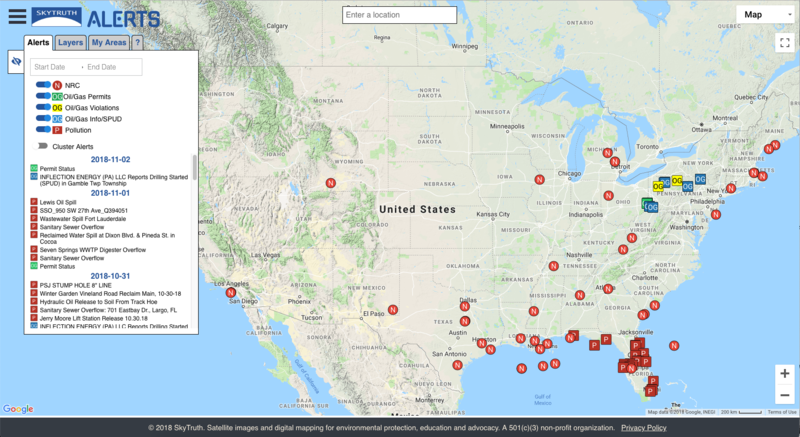 Did you see the recent front page article in the Washington Post that featured SkyTruth’s work tracking a 14-year oil spill in the Gulf of Mexico? Why is Shepherdstown’s own SkyTruth featured so often in the international press? Come find out! Founder John Amos and key staff members Christian Thomas and Ry Covington will talk about our work tracking pollution, mapping flaring and fracking, revealing the true scope of devastation from mountaintop mining and illuminating commercial overfishing. There’ll be a Q&A session followed by some light refreshments. For those of you who know us already, please join us with a friend you think might be interested to learn more about this West Virginia-based nonprofit that has global impacts. 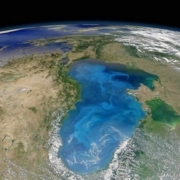 SkyTruth: sharing the view from space to inspire people to protect the environment. If you can see it, you can change it!